Use chalk to color, write on, and decorate this horse! Clean up is easy- just wipe with a damp cloth, and the Chalkboard Horse is ready for a new design. Classics Size Model Horse. 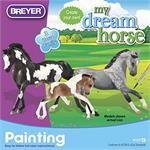 Painting is beloved by Breyer fans of all ages, and now there's a unicorn they'll want to add to their herd! Kit includes everything needed to paint a colorful unicorn. Includes: 1 unicorn, 1 paintbrush, 6 paint pots, and instruction sheet. Paints, brushes and a detailed "how-to" booklet can help you paint these two Paddock Pals model horses to look like your favorite horse. All that's needed is the touch of a young artist! Photography in booklet shows coat colors, eye and hoof details. Follow the misguided adventures of Pumpernickle the Pony and his trip to the County Fair. Our easy-to-follow instructions and included crayons make it simple to create and color the barn of your dreams! Each bag includes paintbrush, 4 paint pots, instruction booklet and a base-coated, ready-to-paint Stablemates horse. The adorable Paint Your Own Farm set combines crafting and role play! Paint and customize 6 different farm animals, then add accessories for role play! Set includes: foal, cow, pig, hen with chicks, donkey, dog,and accessories.